Space-Saving, Stackable Innova 44 Shakers dependable operation and innovative design. Now, with more than 40 models available, you can choose the perfect shaker to suit your needs. Our top-of-the-line Innova Lab Shakers feature the NBS triple-eccentric drive for uniform motion and superb reliability under the most adverse conditions. With lab space at a premium, NBS can offer several stackable models, to help you maximize your space. Innovative designs and unparalleled fabrication provide you with day-in and day-out worry-free operation, often for decades of continuous use. 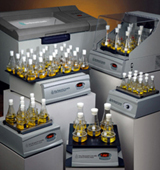 Advanced microprocessor controls ensure reproducible results and operator convenience. "Set it and forget it" programming in our newest models enable you to store and recall multiple parameter - multi-step recipes for convenient, automated operation. Numerous safety features are built in to protect you, your cultures and your shaker. 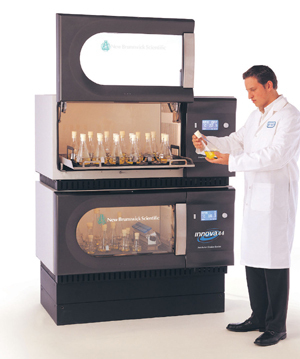 We offer the largest selection of lab shakers in the industry - over 20 models in our Innova line alone, to meet virtually any culturing or molecular biology application. Our Excella shakers are designed for lighter workloads, with a more limited range of options. While these microprocessor-controlled shakers may not offer all the advanced features or specifications of the Innova models, they are affordably priced and offer an excellent alternative when budget constraints are an issue. A wide range of platforms and accessories is also available.